Researchers have proposed a new model of Alzheimer’s that suggests mitochondria — cellular power plants — might be at the center of the disease. Pictured are neurons with mitochondria. Although natural selection is often thought of as a force that determines the adaptation of replicating organisms to their environment, Harvard researchers have found that selection also occurs at the level of neurons, which are post-mitotic cells, and plays a critical role in the emergence of Alzheimer’s disease. Using the principles of natural selection, Lloyd Demetrius, a researcher in population genetics at Harvard’s Museum of Comparative Zoology, and Jane Driver, an assistant professor of medicine at Harvard Medical School, have proposed a new model of Alzheimer’s that suggests mitochondria — cellular power plants — might be at the center of the disease. The study, which builds on earlier work by Demetrius and David Simon, an associate professor of neurology at HMS, was described in a recent paper in the Journal of the Royal Society Interface. The prevalent model of Alzheimer’s is known as the amyloid cascade model. Proposed more than two decades ago, the amyloid hypothesis says that Alzheimer’s is primarily driven by the accumulation of beta amyloid in neurons. The accumulation is thought to be triggered by a mutation in the nuclear genome. A number of clinical trials have been conducted based on the model, but none have shown positive results. That prompted Demetrius and Driver to take a hard look at the fundamental underlying assumptions. “We felt that, in order to explain the exponential increase in Alzheimer’s with age, we had to move away from the nuclear genome and look at what is going on with the energy-producing organelles,” said Lloyd Demetrius, a researcher in population genetics at Harvard’s Museum of Comparative Zoology. 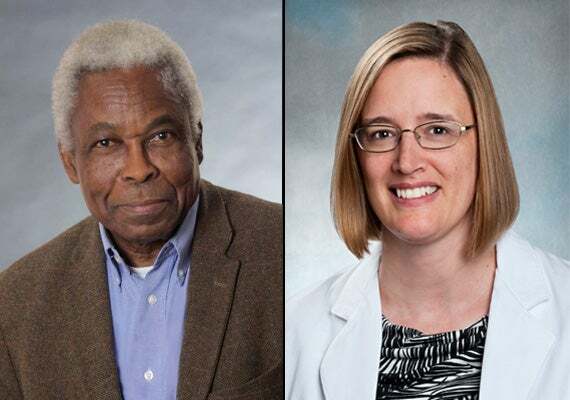 Demetrius and Jane Driver, an assistant professor of medicine at Harvard Medical School, used the principles of natural selection in their research. The genetic mutation model could explain early onset Alzheimer’s, but this form of the disease accounts for only about 5 percent of cases. In the model Demetrius and Driver describe, the disease’s first step is what they call “mitochondrial dysregulation.” The process is largely part of the natural course of aging. As a person ages, the researchers say, the mitochondria in the cells generate energy less and less efficiently. Mitochondria, with their own DNA, are akin to the descendants of simple organisms that lived in a symbiotic relationship inside more complex ones. The mitochondria that produce cellular energy from nutrients such as glucose, in a process called oxidative phosphorylation, are incredibly efficient. However, the process has the side effect of producing oxygen-free radicals, which can damage mitochondrial DNA and proteins. Random mutations can further damage mitochondrial structure and function. The accumulated harm leads to an energy deficit, triggering a compensatory event that Demetrius and Driver call “metabolic re-programming” — unaffected mitochondria increase output, by upregulating oxidative phosphorylation, to make up for the energy deficit. The end result is two broad types of neurons ― relatively healthy, and impaired ― that must compete for nutrients. Impaired neurons, since they contain some mitochondria with upregulated activity, have an advantage in the competition. That competition, Demetrius said, plays out according to the principles of natural selection. With normal aging, the two populations eventually reach equilibrium, typically with healthy neurons far outnumbering impaired neurons. As long as the balance is maintained, a person won’t slide into the grip of disease. What can set a person on the path toward Alzheimer’s is the metabolic upheaval that accompanies both physical and emotional stress. Ailments such as a stroke or a major depression disrupt the neuronal microenvironment and put additional stress on neurons. Some die, and others have to increase their energy production in order to survive. As a result, impaired neurons take up a larger share of the brain’s resources and begin to out-compete healthy neurons for nutrients. The healthy neurons die immediately because they are overwhelmed by the impaired neurons. The impaired neurons ultimately die because of the deleterious effects of the reactive oxygen species generated by their upregulated metabolic activity. Metabolic reprogramming, a cornerstone of the model, is called the Inverse Warburg Effect because it is analogous to the mode of metabolic alteration the Nobel laureate Otto Warburg proposed almost 100 years ago to explain the origin of late-onset forms of cancer. The metabolic shift in this case is the upregulation of glycolysis. The treatment involves interventions such as exercise, drugs, or nutrients that alter the neuronal microenviroment so that healthy neurons maintain their selective advantage and the brain doesn’t shift from normal to pathological aging. There is some evidence that increasing the availability of energy precursors such as lactate, ketones, and triglycerides may help neurons facing an energy crisis. Approaches that support the health and function of the astrocytes — the neuron’s metabolic support cells — could also act protectively. “If we relax our efforts, even for a moment, this thing [malaria] will come back and be worse than before,” said Sonia Shah (on screen), a science journalist who was part of a panel discussion titled “In Our Blood: Challenging Millennials to End Malaria.” Joining Shah, who used Skype to participate, were Kate Otto (from left), Maggie Koerth-Baker, and John Brownstein.